The way people watch TV is changing quickly. Even when it comes to sports, more people are choosing cable-alternatives instead of paying a fortune for satellite or cable TV subscriptions. The industry is responding, and more services are popping up. A new one that may interest sports fans is ESPN+. But what is ESPN+, and is it worth paying for? Find out in our ESPN+ review. ESPN+ is offered by ESPN itself, and presents a good value for sports fans – particularly for fans of soccer, golf and baseball. Learn more about ESPN+ programming in the review below. 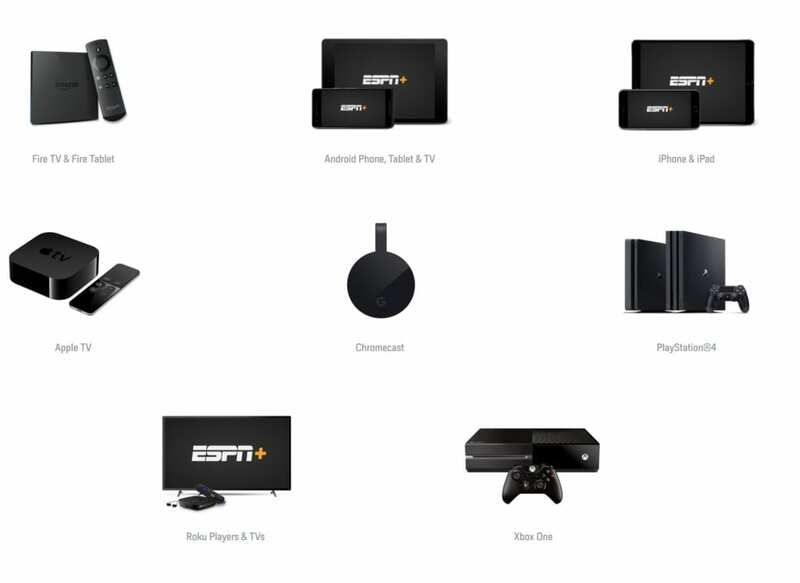 First and foremost, what is ESPN+? Basically, ESPN+ is a standalone sports streaming service offered directly by ESPN. 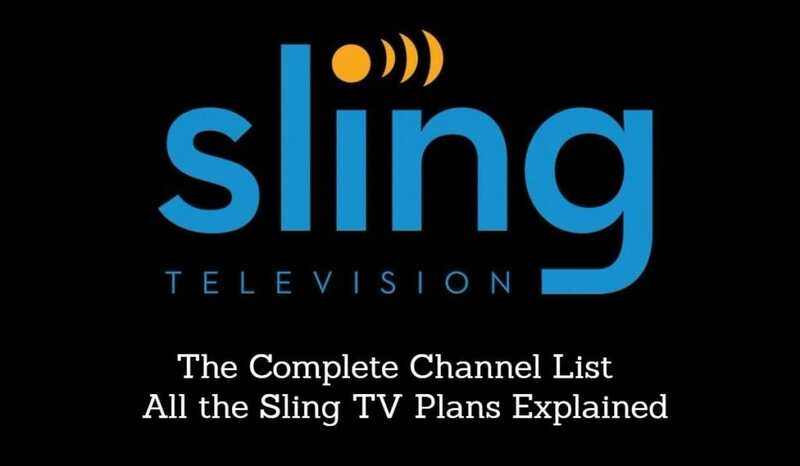 It does not require a cable or satellite subscription to use. For $4.99 per month, ESPN+ subscribers get access to a limited selection of live sports broadcasts, plus an on-demand library of original programming, like the 30 for 30 series. To be clear: ESPN+ does not give you a true ESPN live stream. Most “big ticket” sporting events, like NBA and NFL games, are NOT included on ESPN+. So you won’t find Monday Night Football, NBA games, or college football games on ESPN+. What you will find is a solid selection of less-popular sports, as well as some MLB, golf and soccer coverage. We’ll explain more about what you can watch with this service further down in this ESPN+ review. In essence, ESPN+ is primarily meant as a supplement to other sources of sports. For most sports fans, the service won’t cover enough live events to scratch that itch. That said, some sports receive better coverage than others. Fans of soccer, golf and lower-tier college sports will get a lot of value from an ESPN+ subscription. At a glance, here’s what we think about ESPN+: It’s worth $5/mo for most sports fans. However, it most likely won’t be enough to serve as the only way you watch sports. Luckily, there are many ways to watch sports online nowadays. 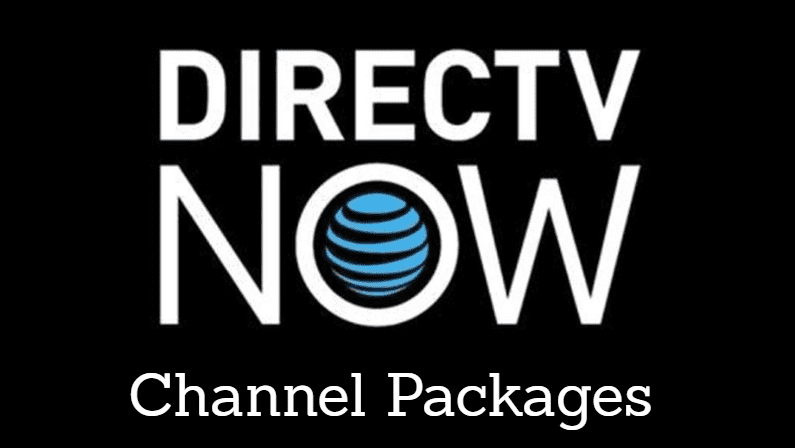 Select Live Sports – Subscribers can access some live sporting events without cable using ESPN+. Enjoy select games from leagues including MLB, MLS, NHL, UEFA Nations League, Serie A, US Open, Wimbledon, select college sports and more. Blackouts and restrictions may apply. See the section below for further details. Original Programming – ESPN+ also gives you access to on-demand original programming. Series like 30 for 30, E: 60 and O.J. : Made in America are all available. ESPN+ Exclusives – The service also offers some content that’s exclusive to ESPN+. This includes ESPN FC, Draft Academy, Kobe: Detail and more. 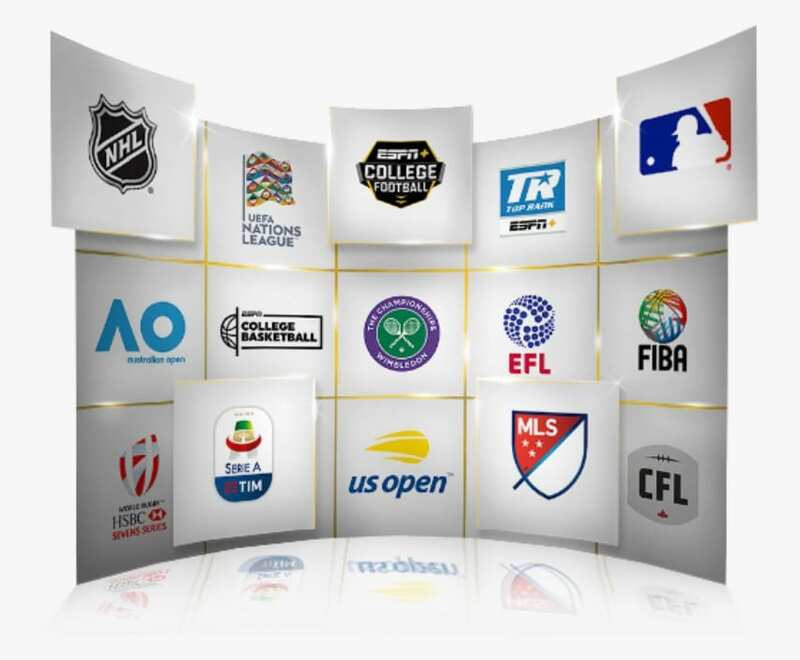 Global Sports – ESPN+ gives you access to leagues and teams that you might not normally see on TV. Get live access to select matches from FIBA basketball, EFL and UEFA Nations Cup soccer, CFL football, rugby, cricket and more. Mobile Viewing – You can use ESPN+ to watch live sports from anywhere in the United States. Watch on your mobile phone, tablet or other supported device. Blackouts may apply. Pause & Rewind – Never miss a moment with built-in pause & rewind functionality for live games. You can even catch full-game replays on-demand after the live broadcast! For a list of sports you can watch on ESPN+, see the section below. Click here to try ESPN+ free for a week! Here are the sports you can watch on ESPN+. Keep in mind that blackouts can apply to some games, particularly for local teams. Soccer – Select matches from MLS, Serie A, UEFA Nations League, and EFL. Of all the sports, soccer gets the most coverage. ESPN+ absorbed the old MLS Live service, and also offers other world soccer leagues. It’s a great deal for soccer fans. Mostly lower-tier conferences are covered, including America East, Big South, Big West, Horizon, Ivy League, MAAC, Missouri Valley, NEC, Southern Conference, Southland, Summit League, Sun Belt, etc. Overall, the coverage of live sports on ESPN+ is fairly limited. This is to be expected for a $5 service, but still – don’t expect it to replace the need for more costly subscriptions. The sports covered on ESPN+ are mostly ones that are less popular among most American customers. That means NFL and NBA are completely off the table, and MLB is limited to one random game per day. That said, there are some areas where ESPN+ shines. Soccer fans will enjoy a wide range of coverage of both domestic and international games. College sports fans who follow less-popular teams will also find a lot of value on ESPN+. And anyone who enjoys lesser-followed sports like rugby and cricket may find the $5/mo price tag well worth it. ESPN+ just launched in early 2018, so it’s still a relatively new service. We expect device compatibility to continue expanding as the service evolves. ESPN+ costs just $4.99 per month. There’s a free 7 day trial available, as well. There’s no contract or commitment, so you can cancel any time. You can easily cancel ESPN+ through your online account or by contacting support. While ESPN+ is meant mostly as a supplementary program to other sources of live sports, the service doesn’t actually require any other subscription. You don’t have to be a cable or streaming service subscriber in order to use ESPN+. All you need is an internet connection and your ESPN+ subscription. Overall, how does the service rate? Is ESPN+ worth it? Well, considering it’s $5 per month, a lot of sports fans will probably find good value in it. It’s particularly valuable for fans of soccer, college sports from less popular conferences, and niche sports like rugby, cricket, and lacrosse. That said, there’s limited to no mainstream sports coverage. You won’t find NBA or NFL games covered, and MLB is very limited. In the end – is it worth $5 a month? Certainly. Can it be used as your primary source of sports coverage? Probably not. Regardless, the service is certainly worth testing out. Click here to try it FREE for 7 days!